The World in a Shell is a high-tech living/working unit, based on the dimensions of a standard sea container. It is a self-sufficient and independent unit that functions in every climate and geographical environment. 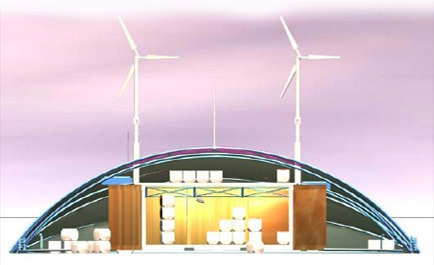 It is powered by renewable energy (wind and solar) with a massive energy storage capacity. In technical terms it is the world's most powerful micro-grid technology for its size running on renewable energy. Technology advancement for its own sake was not the goal; the aim was to develop a vessel that facilitates personal interactions, sharing of knowledge and to suggest solutions on autonomy and decentralisation. Beyond all practicalities and most important, WiaS' aesthetics add a maximum on inspiration. In contrast to usual sea containers, this container has no doors on the front end, but on the sides. This is due to history of the container, which was once used by the German postal service, who required side access to facilitate on and off-loading from trains. Pairs of hinged panels can close both sides. There is also a small access door in the front end of the container, which makes it possible, in cold surroundings, to keep the large side doors sealed. It also features a water harvesting and recycling system, uses hydraulic self-lifting technology (to facilitate movement onto and off transport), and is built from easily replaceable parts. The World in a Shell environment consists of the container with a foldout tent construction, expending the floor space from 15 m2 to almost 120 m2. When deployed this creates a protected area, where all sorts of activities can take place. Within the construction, a modular, 'Lego-like' interior has been created with a plug and play fire-wire like technology for energy, water and air daisy-chaining possibilities. This interior is composed of loose and stackable modules that can be re-arranged according to the required function. A wide range of appliances and equipment is available to enable transformations into a cinema, a stage for theatre productions and into a community space for play and workshops. It can also be utilised as a regular domestic setup for feeding visitors and the crew.